Following the creation of the Talbot marque out of the remanants Chrysler Europe in 1979, parent company PSA decided that the new brand needed a high-publicity boost to its image. The result was a two-tier venture into motor sport. In Formula One, PSA became the Ligier team’s title sponsor, rebranding it as Talbot, whilst using tuneful (if rather elderly) Matra V12 engines in place of the Ford Cosworth DFVs that Ligier had previously campaigned with. In rallying, Talbot put its finances behind the Sunbeam-Lotus project, which had already been under development during the Chrysler era. The Formula One project was a spectacular failure, and Talbot F1 cars graced the world’s circuits for barely two seasons. However, the Talbot Sunbeam-Lotus was a stunning success, scoring a memorable win at the Lombard-RAC rally in 1980, thus breaking years of Ford dominance. However, the Sunbeam was not planned to remain in production after 1981, and following the introduction of the mid-engined Renault 5 Turbo, Talbot knew it needed to work on a similarly spectacular car. 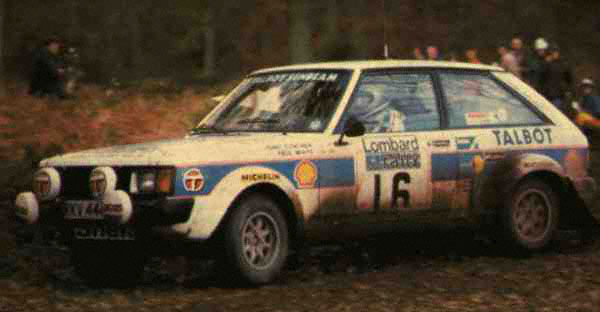 The Talbot Sunbeam Lotus took part in international rallying from 1979 to 1982 and won the World Championship for Talbot in 1981. Its most famous achievement was at the 1980 Lombard-RAC rally, Britain’s round of the World Rally Championship, where Henri Toivonen became the event’s youngest ever winner and Sunbeam Lotus cars finished 1st, 3rd and 4th – the last time a two-wheel drive car won the RAC. Des O’Dell was presented afterwards with a Sunbeam Lotus road car bearing the registration RAC 134W! In fact, Talbot’s Sunbeam Lotus won their class (Group 2) on the RAC for three years in succession, culminating in 1982 with the last ever win in this class before the FIA rules changed to Groups A, B, etc. 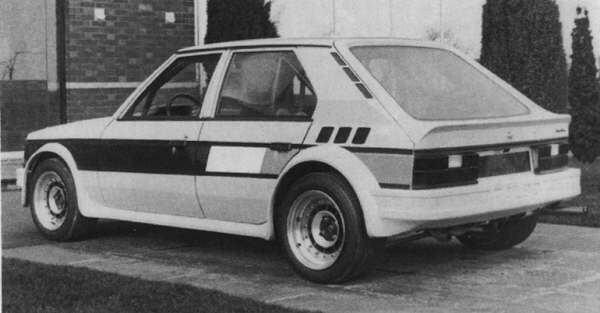 Some Sunbeam Lotus’ were still driven in WRC events being homologated into Group B in late 1983. Sunbeam Lotus works drivers included the late Henri Toivonen, Guy Fréquelin (co-driven by Jean Todt) who narrowly missed out on being the Driver’s World Champion in 1981, Stig Blomqvist, Tony Pond, Andrew Cowan and Jean-Pierre Nicolas. Russell Brookes also competed in a works-built car, privately sponsored by Andrews Heat for Hire. Lotus began work on a “silhouette” Horizon, identifying that the development of a similar concept to the Renault’s was the way forward. Using the same Lotus slant-four engine, sited behind the front seats, the Horizon Group B was the result, and it has to be said, an exciting looking proposition it looked. However, only two prototypes were built before PSA canned it. In 1981, Audi exploded onto the rally scene with its Quattro, and immediately, all competing rally teams realised that they would need four wheel drive in order to remain competitive in the future. Engine: 1219 cc Inline 4 cylinder.